Supports connective tissue, tendons, ligaments, skin, hair, nails and muscles. According to the U.S. National Institutes of Health, collagens are a family of proteins that are part of body tissues, including skin, cartilage and joints. While there are more than a dozen types of collagen, 80 to 90% of collagen found in the body consists of types 1, 2 and 3. 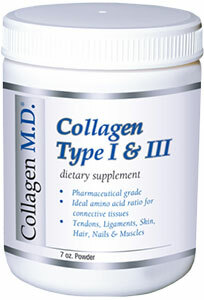 Collagen M.D. Collagen is made from pure type 1 and type 3 collagen proteins that have undergone enzymatic hydrolysis for reduced molecular weight. Only 100% food-grade hydrolyzed collagen is used to ensure superior quality and safety.